It was a difficult decision to leave my current position at St. Michaels as I have been there for 8 years and there are a number of dedicated and strong juniors. That being said, sometimes you have to do what you think is best for you and I believe that is what I'm doing with this move. What lies ahead in Turks and Caicos and for Serious Squash? The club Graceway Sports (http://gracewaysports.com) has 2 courts and my main job will be to build up numbers in their program. I will be focusing a lot on increasing the junior development and eventually taking a team to some international tournaments. I intend to do a lot more video analysis, blog and social media posts. Another main goal of mine will be to set up tourist packages for people who want to go to a place with beautiful beaches and also get in some high quality squash coaching. Serious Squash will soon be stress free living on island time. I did visit for a few days in December to see what I would be getting myself into. Here are a few pics from my trip. 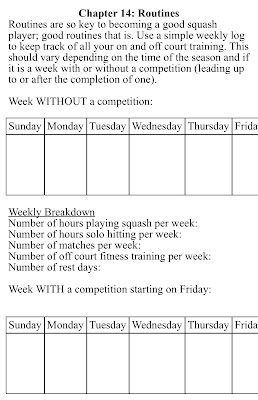 Since my competitive days playing varsity squash I've always written squash tables, charts and documents. 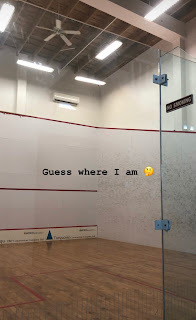 I've posted hundreds of my opinions, thoughts and facts about squash and coaching on this blog over the past few years. Recently I was going through my computer and I discovered piles of documents I designed over the years. Many were for coaching purposes or simply out of interest. I completed my bachelors in kinesiology and my masters in coaching studies. 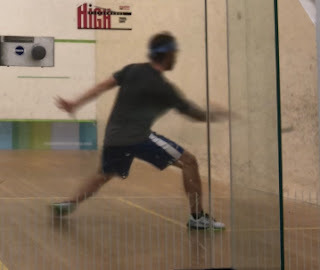 Even though I wasn't too fond of school in high school, I always loved learning more about squash, training and sport at the post secondary level. Learning about things that are interesting and that can actually help you become better at squash are great. The more I knew, the better the squash player I could become and when I started coaching, the more I information I could pass on to my students. 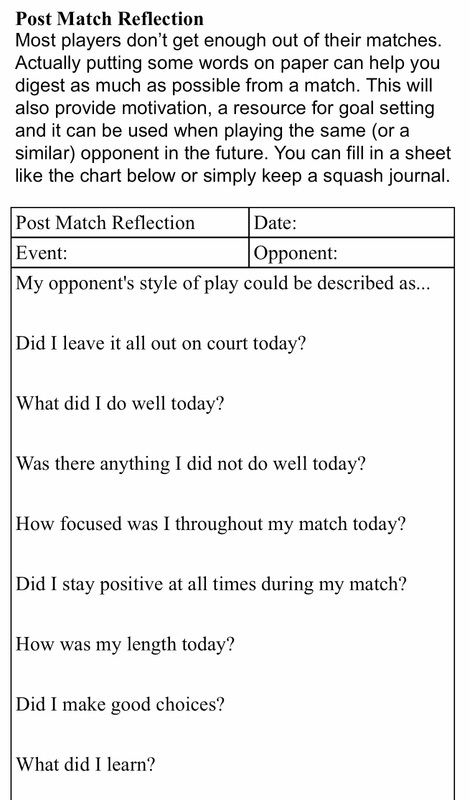 As I got into coaching I started constantly designing various excepts which you will find in this manual which I've titled 'A Guide To Winning Squash.' 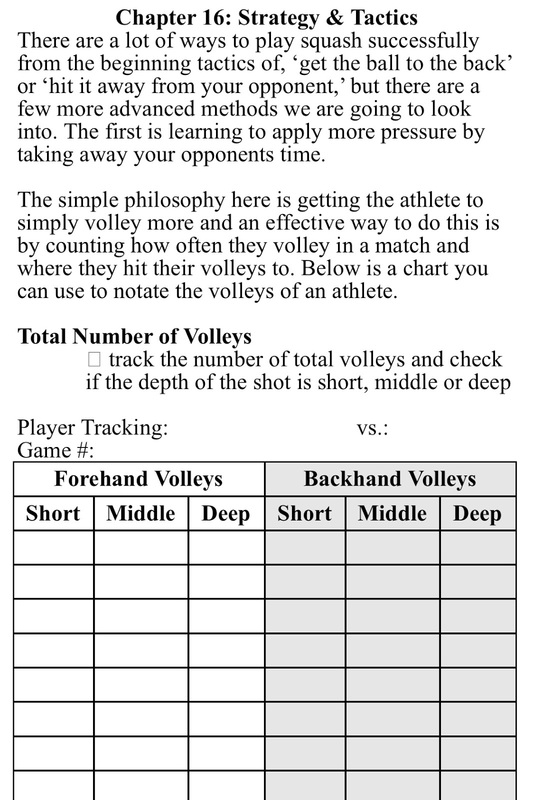 They are meant to be thought provoking and lead an athlete through the process of designing an individual tool and skill set they can use for a specific part of their game. 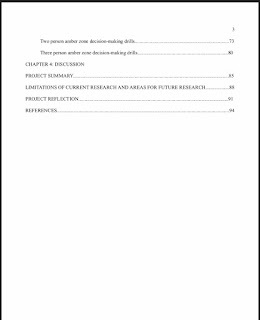 Some of you have already purchased my masters final project which was extremely comprehensive. I've recently posted it in the Serious Squash Shop as a digital download. That document took a LONG time to write, edit and get to a point where it was approved by my academic supervisor. 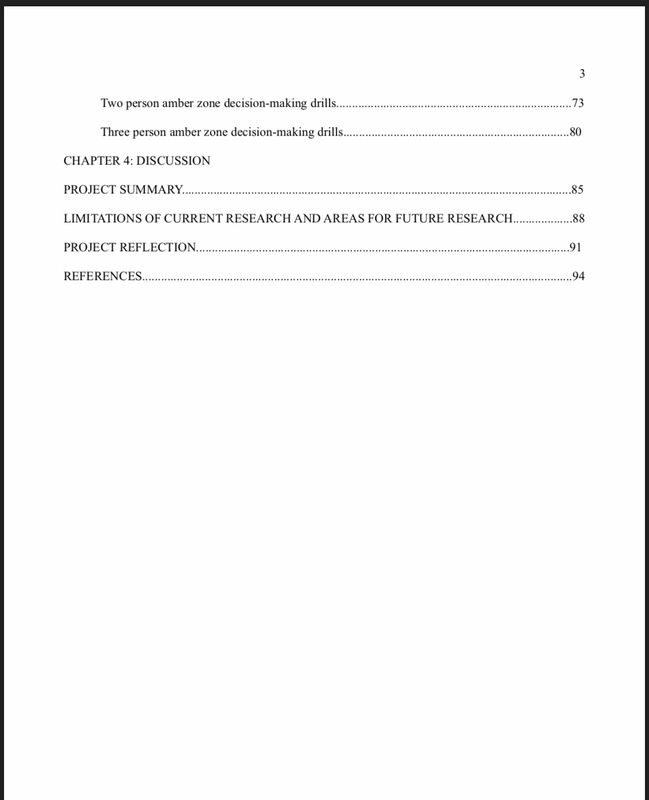 Now I haver finally finished compiling my squash tables, charts and articles in a 17 chapter and 70 page working document. 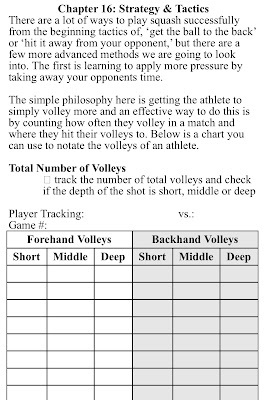 It's a bit of a scrapbook for athletes or coaches to use. Some sections go into great detail, while others are brief and just touch on what I feel is interesting or valid. If this is the type of thing that interest you, you can download a digital copy in word and pdf format for $9.99CDN now in the store at SeriousSquashShop.com/collections/squash-documents It comes with a no questions asked money back guarantee. Here are a few more clips from the document. 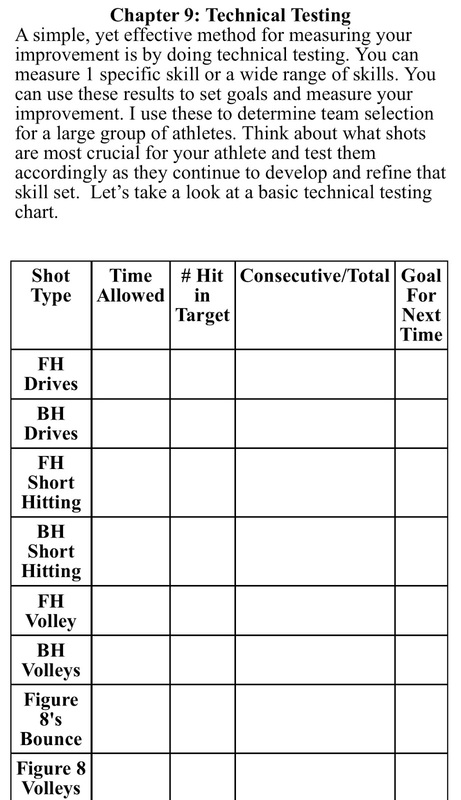 When you practice, either in condition games, drills or solo hitting, do you ever use targets? After 30 years of playing and coaching squash, I realize how frequently people hit a shot with no given target in mind. We all know to start with that we want to hit the ball straight and tight, at least most of the time. But you're going to be a better squash player if you can hit the ball where you want it, plain and simple. Less focused on is the weight of shot or height of the shot. Let's start with angle/direction. One of the most common flaws when people hit length is that they use the sidewall as a crutch. I can hear you asking me, 'Chris, what does that mean?' Well it just implies that people hit their length into the front wall and then the sidewall to hit a straighish type of drive. But hitting this sidewall too early slows the ball down and doesn't get to the back of the court quick enough and gives your opponent more time to take the ball early. How can you improve the angle of your drives and drops? Awareness is a big part of it. At the World Juniors this summer, the top few boys hit the ball so straight. They didn't always hit the ball right on the wall, but they rarely hit the sidewall early. Doing this well means you have great awareness of your racquet face and you have fantastic control of how angled the racquet face is at contact. When almost everyone plays a drop, they aim for the nick and the ball seems to always hit the sidewall. If you change your focus to hitting the floor before the sidewall, or getting the ball to finish tight you will improve the angle of your drops and they will be much tougher to retrieve, no matter how quick your opponent is. You can also use targets in creative ways (see the video below). Okay, so you understand how to work on improving the angle of your shots. What about the weight of shot? A simple method is just putting a target on the floor against the sidewalls. The stronger the players, the smaller the targets should be. You could use a racquet, a shoe, a target that you get to keep if you hit it (like a $5 bill or protein bar or squash ball box). Sometimes I'll play timed games where only targets count as points. This makes it competitive. You could also use a target for simply bonus points in a game. In solo hitting you can alternate between weights of shots. 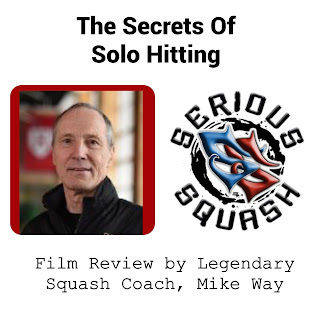 If you've seen The Secrets Of Solo Hitting, you'll know that one of my favourite weights of shot targets are the back corners, but for the second bounce. This is an attacking drive and is quite difficult to hit. Again you can use various targets in the back corner. Working on attacking drives you can either aim for them on every drive or anytime you get an opening. 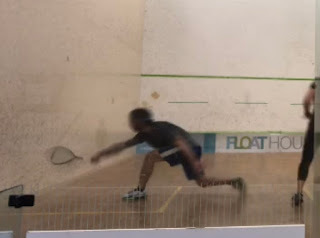 And this is how a lot of top players play; when you have time and space, even from the back of the court you should be aiming for a drive, second bounce into this back corner. Think back to the angle though. If you hit the sidewall too early you have no chance of getting the second bounce into the back corners. Want to improve your squash game? 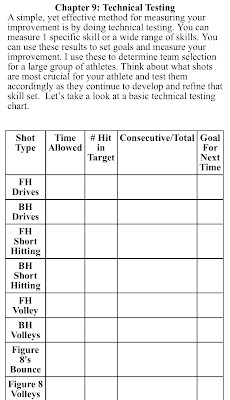 Start using targets and start visualizing a target in your rallies. I know for me if I just place the ball around the court, even if it's into the right areas of the court I'm not going to be nearly as effective if I'm not hitting targets into the right areas of the court. The right weight and angle of shot makes the court play a few feet or inches larger and take time away from your opponent. 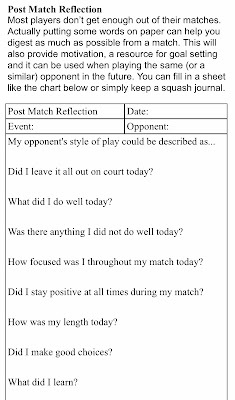 What is pressure in squash? 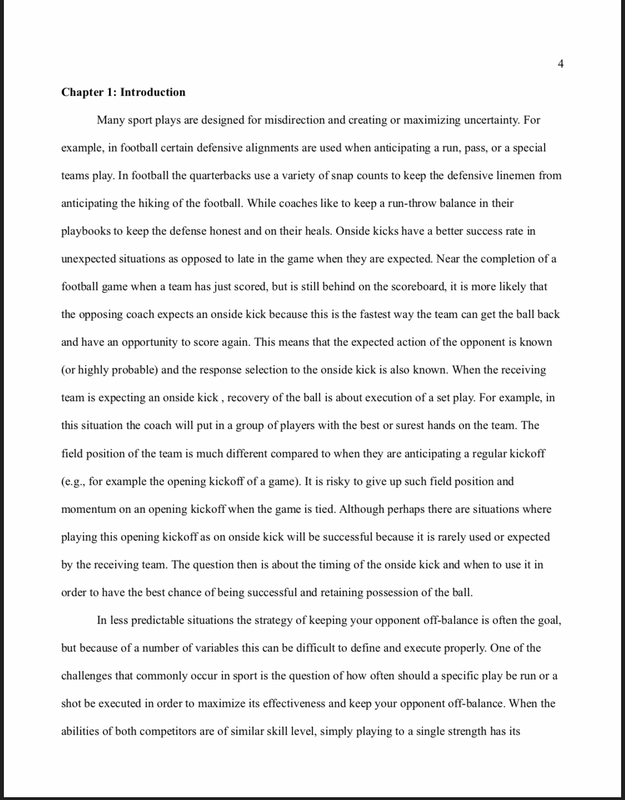 Time and spacial pressure; reducing yours by increasing your opponents. Have you ever wanted someone to professionally analyze your squash game? Do you live somewhere that doesn't have a top active coaching professional? Or do you simply want another perspective on your game? 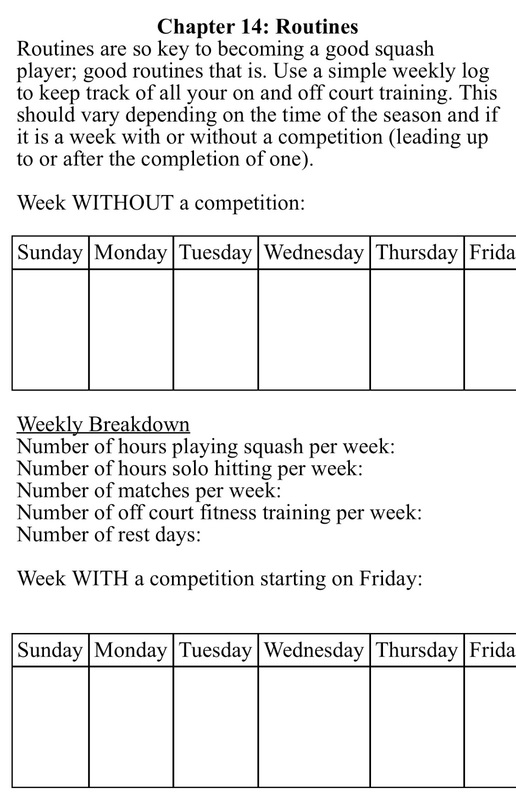 Since starting Serious Squash a number of years ago I've had a lot of keen squash players contact me seeking advice. I've assisted players from a beginner level all the way up to a top international junior level. I've done video analysis for juniors and adults living in the U.S., Canada, Australia, Hong Kong and India. Do you want to know which areas of your game I think are the strongest and which areas you should concentrate on improving? I can also provide tips on how you can best improve these areas. 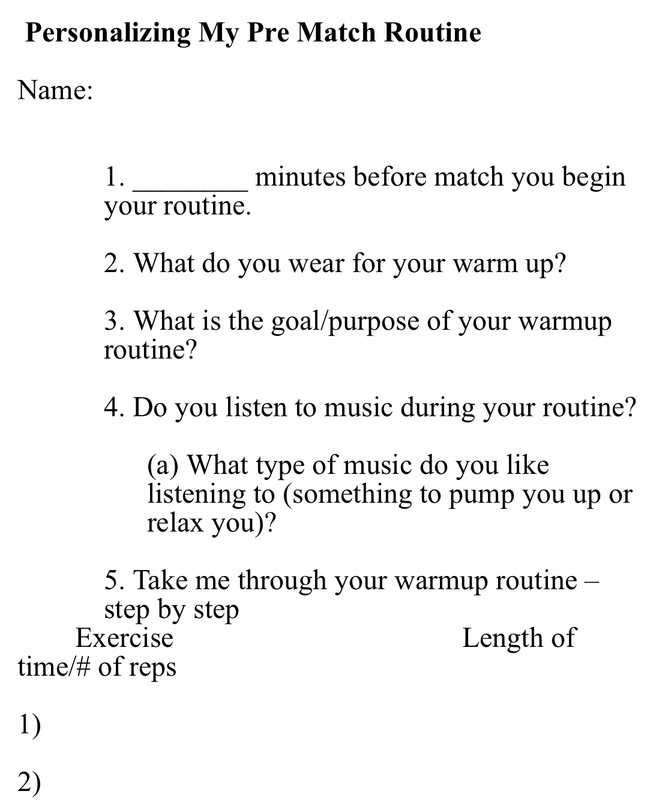 I organize my feedback in terms of physical training, mental skills, technical skills and tactics. You can send whatever footage you like; a practice game, some solo hitting, a drill session or a match from a tournament. You won't be able to send large video files through email so pease upload your video to Youtube (you can mark the video setting as private if you don't want anyone else to see it). I will get back to you with your report within a few days (unless I'm away coaching at a tournament then it may take a little longer). Best of luck on and off the court to all of the Serious Squash fans across the planet in 2019! If you follow the Serious Squash posts closely you'll know I just published a children's book last week. 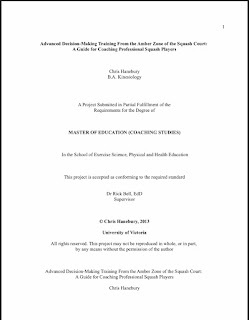 Five years ago I wrote a much different type of document as part of my master's degree and if you are reading this and find it interesting you are also very serious about your squash. My final comprehensive project was a lot of work and took many months to edit. My masters degree was in the education field with a specialization in Coaching Studies. It was quite difficult finding research on squash and I had to transfer some research from other racquet sports. 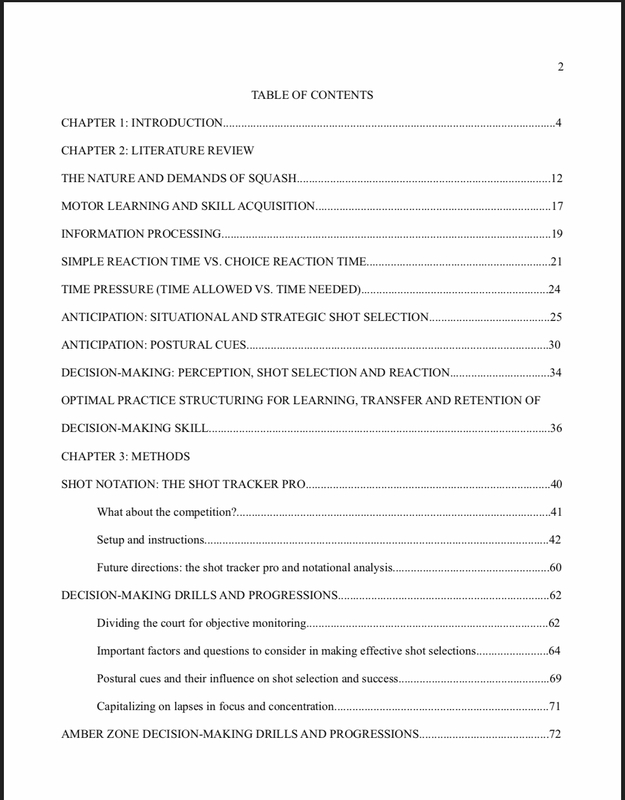 I even emailed back and forth with Roger Flynn who is the only person I could find that has published any literature on decision-making for squash. 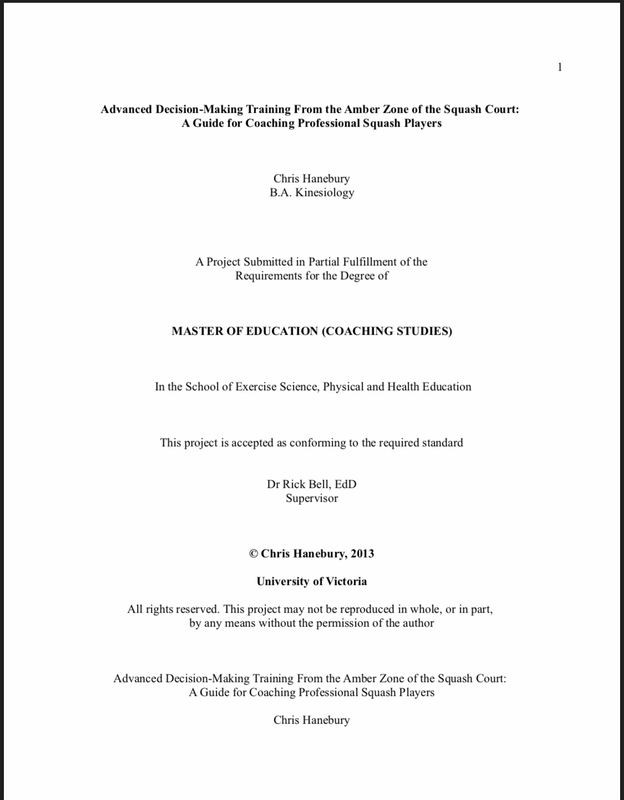 The title of my project is a mouthful and then some; Advanced Decision-Making Training From the Amber Zone of the Squash Court: A Guide for Coaching Professional Squash Players (cover page below). My paper is 98 paper in length. 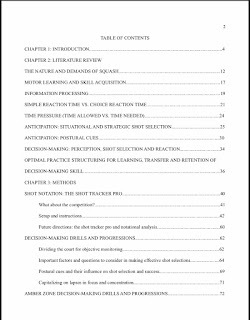 The chapters literature I review includes: the nature and demands of squash, motor learning, information processing, reaction time, anticipation, time pressure, postural cues, situational and strategic shot selection, decision-making and optimal practice structuring (as seen below). 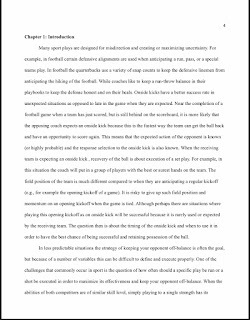 I also have a method section which includes a proposed shot notation analysis for an app that could provide real time feedback for players plus a section on decision-making drills and progressions. Today is going to be a 1 off where squash does not come up and have anything to do with the post. Over the past year and a half I've started playing guitar and writing songs. 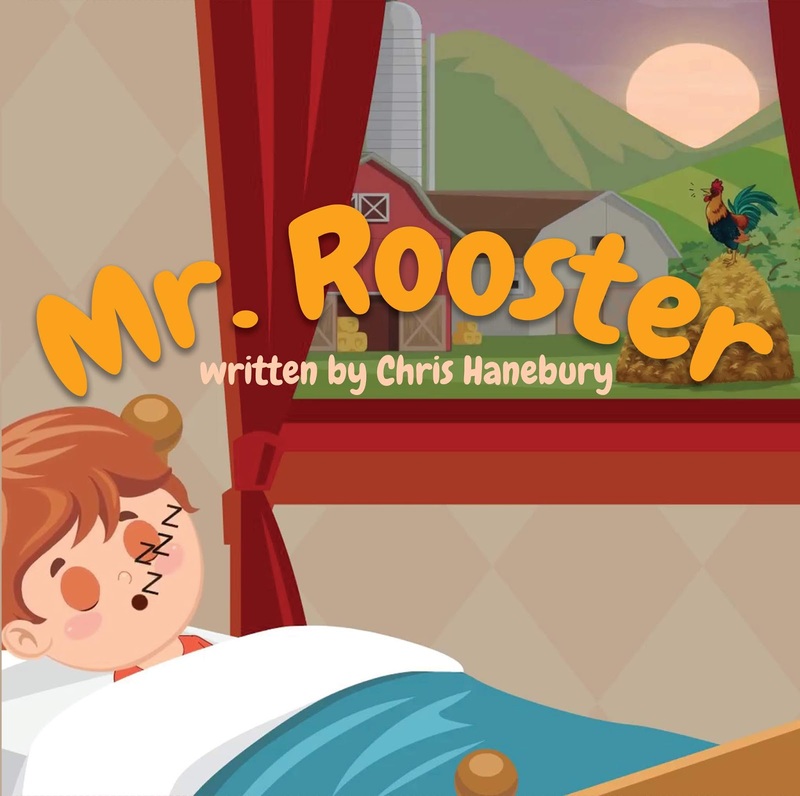 I recently wrote a children's song called Mr. Rooster and I hired a company do an animated music video for it which I directed. I also had someone help me design a book based on the song. Here is a look at the books cover page. The song is about a boy who is woken up early in the morning by Mr. Rooster and he goes around the farm as a detective to find out which animal was responsible for waking him up. He encounters many animals along his journey. This is a video and book for young kids/toddlers. So if you have 1 or know someone who does feel free to share the video and purchase a copy of the book. I'll be back with plenty of more squash posts soon! When I was a child I was told to always hit off my front leg. I hated doing this from the front right as I wasn't very strong or comfortable hitting off my left leg moving forwards. Eventually with enough practice I got comfortable playing off of both legs from everywhere on the court. 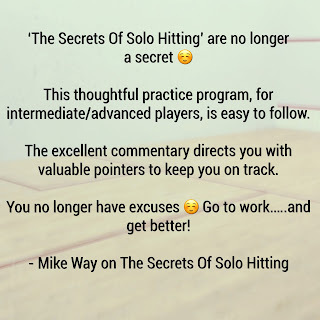 In the middle of a match you shouldn't be focusing on which foot you're playing off of, but in a controlled practice setting you should intentionally practice hitting off of both legs from either side of the court. Obviously there are certain shots and specific areas which will require more open stance shots. The problem most people have playing open stance is the they are unable to maintain their balance and get any power on their shot. If you are under a lot of pressure moving backwards and playing off your back leg you have to focus on opening the racquet face and lifting the ball. If you try and drive the ball when you're weight is shifted solely on your back foot you will have trouble with your accuracy. On the other hand if you are in a strong posture you should still be able to drive the ball with a decent amount of pace off of your back leg. I've seen than video clip of Greg Gaultier ghosting to all areas of the court on 1 leg and then again with the other leg. He knows at that level he must be entirely comfortable playing off either leg from anywhere on the court. I've been guilty of using my dominant leg too much and during the course of a hard match or tournament and an entire season it begins to break down and fatigue and it can lead to issues either chronic or acute injuries in your hips, knees and back. In a lot of my lessons I start off by warming up the pupil with intentionally having them play drives off of both legs to ensure they slowly but surely get more comfortable playing off of either leg on both sides. Here's a rally from last week where I played every shot open stance. And the next time you watch a PSA match look how often they do this. It might surprise you. I first met Mike Way when I was a young junior in Toronto. He’s worked with Canadian squash legend Jonathon Power and has been the head coach at Harvard for a number of years now. 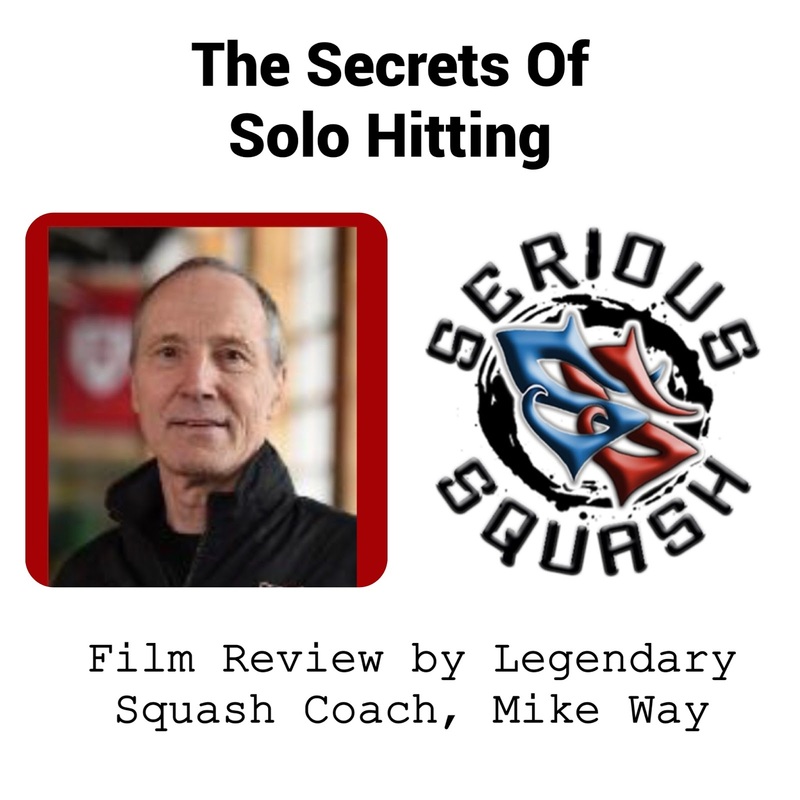 I asked Mike if he could watch the Serious Squash film, The Secrets Of Solo Hitting and provide a review to help me promote it. It was my first film (of 3 so far) and it contains 30 solo drills along with some instruction. Last night at practice we talked about the state of flow, also referred to as being in the zone. In this state is where we will play our best squash where our shots seem to be spot on and we seem to thoughtlessly make smart decisions. But sometimes no matter what we do we just don't find our best squash and this zone where we play our best squash in. I notice that a lot of players play below their standard when they perceive themselves to be in a big and meaningful match. Even at the pro level many of the top players preform below their standard level of play when it finally counts. I believe the cause of this is players getting out of their ideal state of play often because they try too hard and so badly want to perform well. 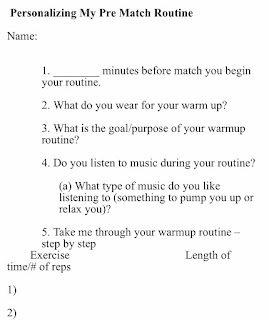 So how exactly can you increase your chances of finding this flow state regardless of who and where you're playing? Here are some of the ideas we talked about last night plus a few others. Prematch Routine - often when we walk on court we already have a mindset which will foster or inhibit the odds of playing within this zone. If we are having destructive poisonous thoughts like 'this person is too good' or 'this will be easy' or if we are simply not feeling like playing a tough match we are inbox trouble. Having a routine to prepare yourself mentally before you even step out on court can prepare your mind as much as your body for playing it's best possible game of squash. Our physical skills don't deteriorate from day to day, it's our mindset, our emotions, our motivation and our energy levels which fluctuate. Between Rally Routines - what we do and say to ourselves to get back on track to help regulate our thoughts and emotions between rallies is so important. Often we will have thoughts about what we could have done better or how upset we are for a call or missing a shot. We can easily get caught in the past and play a poor next point. If we're doing this we will not be playing in the present or the zone. Saying something positive and simple like 'focus' or 'win this point' can help you play the next point at your highest standard. 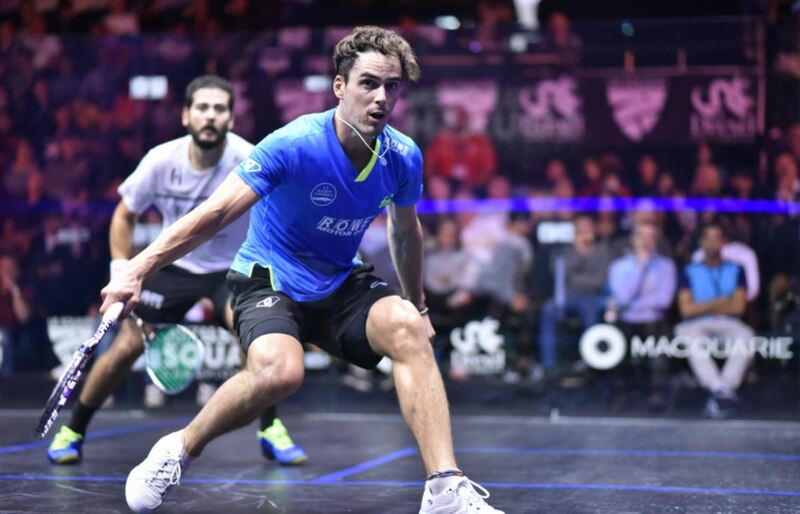 Simple Tactics - either before a match, between rallies or between games we may need a reminder of a simple tactic that enables us to play our best, most effective style of squash. If we are playing 'mindless squash' and not how we want, a little reminder can go a long ways to bringing you back into your best squash which can also enable you to get into a state of flow. For some reason it's easier to get into a state of flow when we are winning more points than we are losing. Play More Of The Shots That Are Working That Day (tactics part 2): I don't know why we constantly like to point out what we or others are doing wrong, but that doesn't normally help people play in the zone. Your opponent, the court, ball and various other conditions vary from day to day and some days certain shots are going to work better than others. On those special days everything is working and that's when squash is the most fun. But if something is off, instead of getting upset and continually making the same mistake perhaps abandoning that shot for awhile and playing more of the shots that are on that day will help you find this zone. Once you establish this zone there is a better chance that some of your other shots will begin to fall into place. Focus on the Process - this is something I am a big believer of. There is theoretically no reason you cannot experience the zone if you are losing. That being said most people get so caught up in winning that they lose the zone as soon as they lose a few points in a row. This is where a routine between rallies, maybe a longer more pronounced one can help get you mentally back on track, or simply stay on track. You may be doing everything right, but this doesn't always mean instant short term gratification. When I'm playing I only give feedback to myself on shot selection and not execution because if I lose playing the right shots I simply need to improve my shots, but if I am losing playing the wrong shots I'm holding myself back. The acronym I refer to with the kids I coach is KISS, keep it simple stupid. Self Regulation - part of routines are being able to recognize when you're outside of your zone. Thinking of your zone as a range can be helpful. I also like to think of this as a plant. When destructive, poisonous thoughts enter our minds it is easiest to get rid of them when they are new, before they have rooted. Once we have focused on these for a longer period of time they will have take root and become too big to simply remove with a cue word/power phrase. The Bigger The Challenge the Greater The Opportunity - when are backs are up against the wall we often reveal our true character. When we are winning and everything is going according to plan it's easy to be a good sport and play well. When things aren't going our way we can either cave and not give our best effort or we can look at this as a chance to show what we are made of; a great challenge that we are up for. With this type of mindset we can still play the next point focused and with great effort regardless of what's happened previously. Superstitions - this is an odd one, but I really believe that superstitions can be helpful in sport. At the World Juniors this summer we had a boy on our team who would change his preserve routine every time he lost a ray, but if he won the point he would stick with it. Sometimes something so simple can help keep the mind out of the way from over thinking. Pretend to Play Like A Top Player - whenever I step out on court after watching one of my favourite pro players I always play better. Someone without knowing exactly what I'm mimicking, I normally play better, with more confidence when I pretend to hit the ball, move and play like a top player. I think a lot of this has to do with the confidence top players display with the way they play and strike the ball. If you play pretending to be Paul Coll it's amazing how much harder you try to get every single ball back! When I play and pretend to be like Greg Gaultier I start playing much more patient and my spacing between the ball always improves. Match Preparation/Confidence - If you are playing a tournament and you didn't train properly for it you're going to suffer physically at some point and this in of itself can keep you from being in the zone. 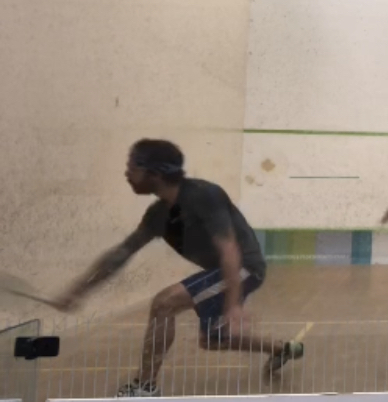 If we go into an event prepared and feeling good about our game there is a far greater chance of playing our best squash and experiencing this state of flow. Do you have any other ways that have helped you enter the zone when you weren't at first feeling it? I love this side of squash. It's really fascinating to me and when I play it isn't always the same thing that gets me into the zone. Sometimes it's about shaking off mistakes quickly, other times it's about playing a simple game, while others it's about just playing whatever shots feel right and another time it may be singing a tune in my head. There A routine can definitely assist you with this process as this is what most pro players have developed over the years. Many will include some imagery in their prematch routine to see themselves playing well and being successful prior to event stepping on court. Most of us will also play better squash when we are having fun as opposed to being too serious or hard on ourselves. Learning how to laugh off mistakes and not take the so personally can help you be more relaxed and enjoy your squash which can assist with the state of flow. Get your mind and ego out of the way and just play! Follow Serous Squash on Youtube, Instagram and Facebook for themes regular posts. Check out the online store at SeriousSquashShop.com where you can find a variety or merch and 3 instructional films. The great thing about having a blog is you can share your views and opinions on a variety of things. There's no filter or boss I have to be cautious about saying something I should not. I always try and be very open about my opinions, whether they are correct or not is sometimes open for debate. Today is an opportunity to do a bit of complaining, so if that's not what you are interested in hearing you're welcome to read no further. This particular topic is about the point system that the Coaching Association of Canada has put into place to maintain your certification. I don't know about other coaches, but having to show that we are continually committing to do coursework to maintain our certification is not going to make us better coaches, plain and simple. I did a 4 year bachelors in Kinesiology, a 2 years master degree in coaching studies and I've trained as a provincial (level 3) coach. I also coach year round a large number of kids, some of whom are quite strong. I also am always posting tips and videos for Serious Squash on social media. Planning practices, doing my own training and trying to develop the best possible junior program and for some reason that isn't sufficient to show that i'm worthy of maintaining my coaching certification? You can accumulate points for maintaining your certification by doing a variety of things like first aid courses (which I've taken at least half a dozen times) and by doing various online courses and attending clinics that have something to do with sport. I constantly read books about coaching and sport yet that doesn't collect points. So really this system is actually interfering with my already successful system of learning and work. This system will make me register for courses that I have no interest in. They will also cost money and take the away from my job. I feel a bit better after getting some of this out. Clearly this certification maintenance program wasn't developed by a coach. If you want to be a good coach you will be, not because of some system that forces you to do extra things. If I want to know something I do research or think about it and figure it out. Simply coaching and working with your athletes makes you a better coach too. 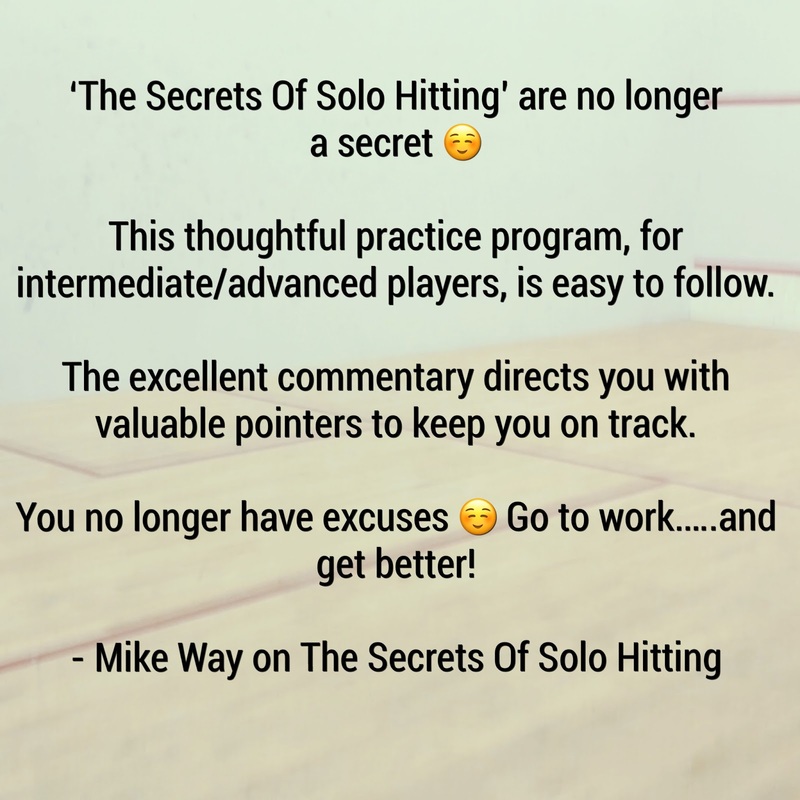 Even from squash specific technical coaching courses (1, 2 and 3) I learned just about nothing and spent a lot of time and money to complete these courses. I understand that there are people trying to justify the professionalism of coaching, but I think the Coaching Association of Canada is way off track here. Some great coaches will lose their certification while others who simply jump through the hoops which shows they do as they are told (but it doesn't meant they are actually committed coaches) will follow along because they have no other option. That's enough of a vent. If you read this far thanks for taking the time to listen. Feel free to comment and let me know if you agree or think I'm off track. 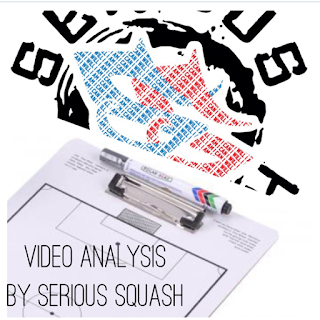 Don't forget to follow Serious Squash on IG, FB and Youtube for lots of tips! Also check out the merch store at SeriousSquashShop.com where you can find loads of cool stuff plus 3 instructional films which can be downloaded and also come with a money back guarantee.